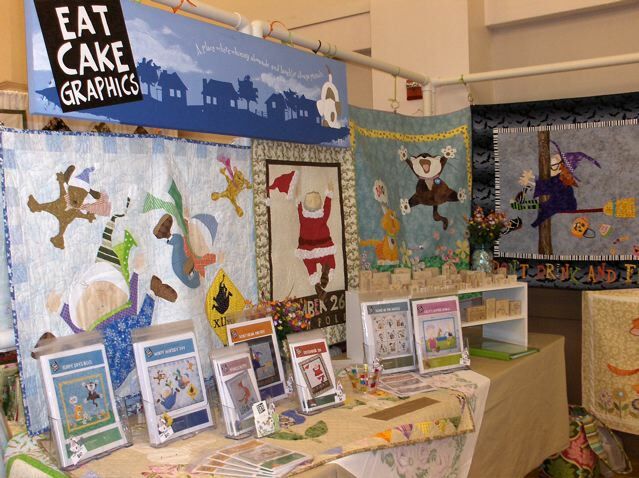 One of the Schoolhouse sessions that I attended during Spring Market was a presentation by Tri-State Printing. 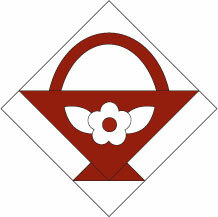 Tri-State is a well know name in the quilting industry. I’ve never used them, but I’ve been aware of them for a long time. 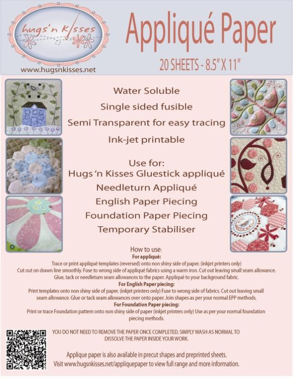 They are extremely knowledgeable about our industry and its printing needs, and they print for a ton of quilt designers. If you need a little or a lot of help with your printed materials, from pattern covers to brochures to self-published books, they would be a good company to contact. 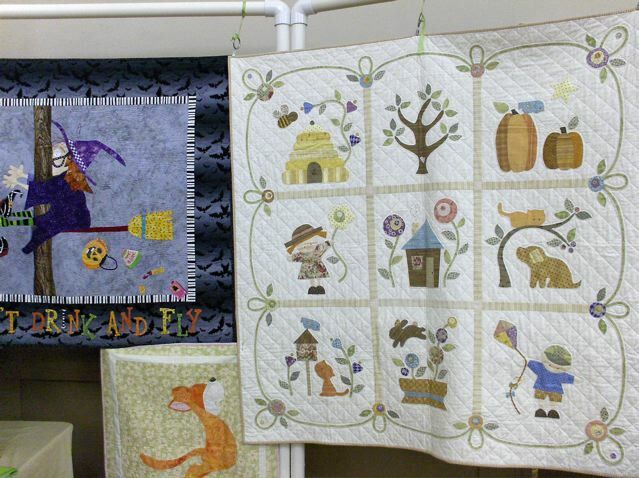 I went to a fun presentation from the Quilted Frog! 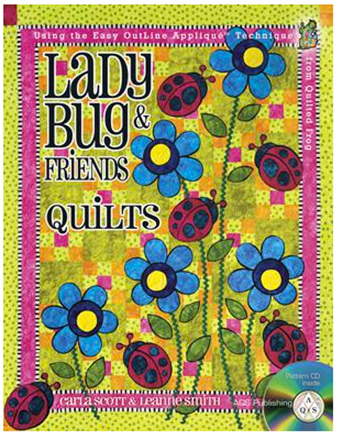 Aka Carla Scott and Leanne Smith, who just came out with a new book from AQS Publishing called Lady Bug & Friends Quilts. 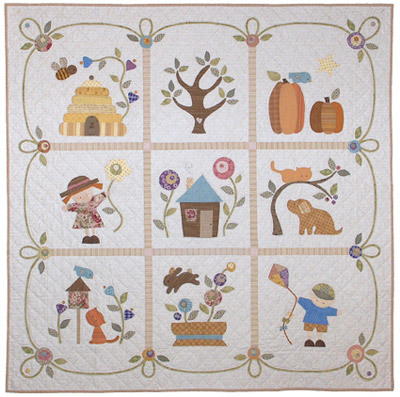 The Quilted Frog gals have developed a distinctive, cartoony, and very fun style they call Easy Outline Appliqué™. 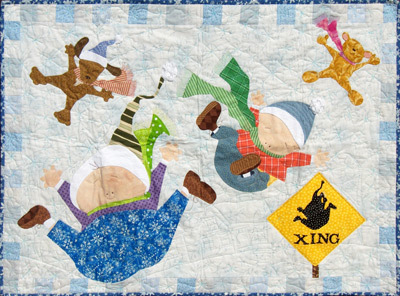 You have to go to their website and see the quilts from the new book! They are so different looking, really fresh and appealing! Over on their website they also have tutorials and videos, so be sure to poke around all the great resources they offer. There’s more from Schoolhouse and Market. 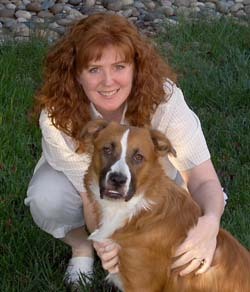 I’m trying to wrangle some guest posts, so stay tuned! In case you ‘re interested in getting that special issue and haven’t found it yet, I have it available on my website now, on the Patterns page. First of all, thank you so much to everyone who visited during the recent blog hop and left nice comments about my Party Frock. Several people suggested that the block would look nice done up in multiples, with different dresses. Great idea! That may just to be something that I need to revisit in the future! A couple designing buddies of mine have just come out with new patterns that are extremely high on the cuteness scale. 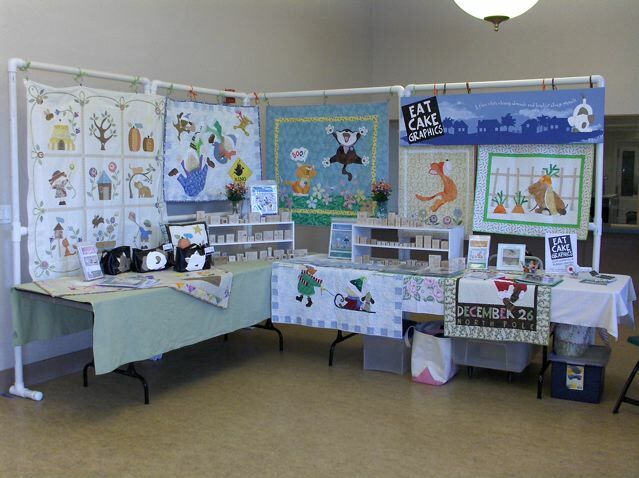 Last fall I blogged about the Tokay Stitchers show, where I had the good fortune to be next-door-neighbors with Rita and Debbie of Lady Bug Lace. 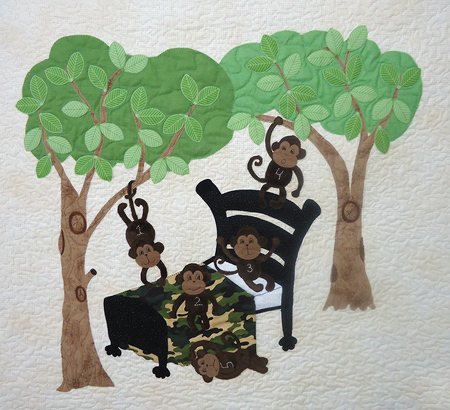 The gals just put out a new pattern called No More Monkeys. Is that fun or what?? 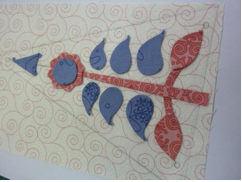 Rita and Debbie told me that since some of the appliqué pieces in the pattern are large, they decided to print one large copy of the design, thinking this would be easier for the quilter than taping several smaller pieces together. 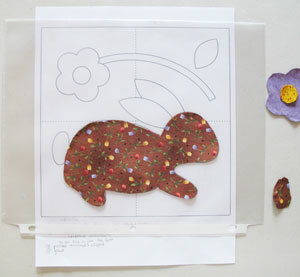 The drawing can be taped up onto a sliding glass door or a large window to trace the appliqué pieces, and you can also use the whole drawing to place under the background fabric for placement of the appliqué pieces. 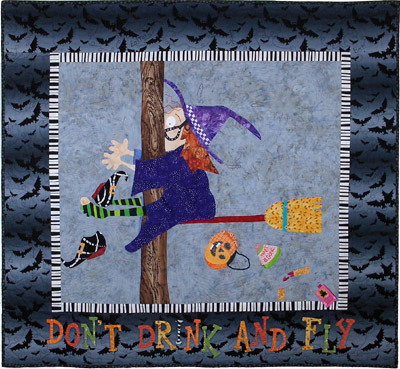 That is certainly an added convenience for the quilter! No More Monkeys is available from their Etsy store. Neeext… Holly Mabutas of Eat Cake Graphics is at it again! 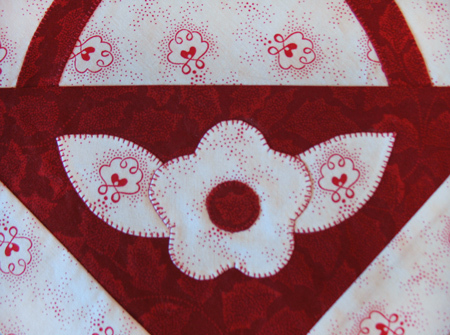 She has just released a darling new quilt pattern called To The World. 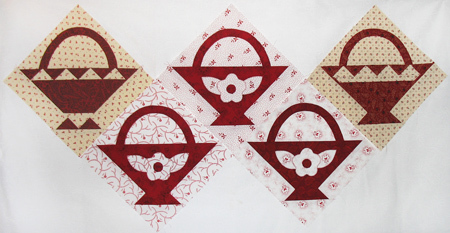 This pattern started out life as a rubber stamp, like many of Holly’s do, and is now available for quilters. The very cool thing about Holly’s patterns (besides their adorability) is that Holy includes instructions for her freezer-paper-on-top-glue-to-the-back method of preparation for hand appliqué. 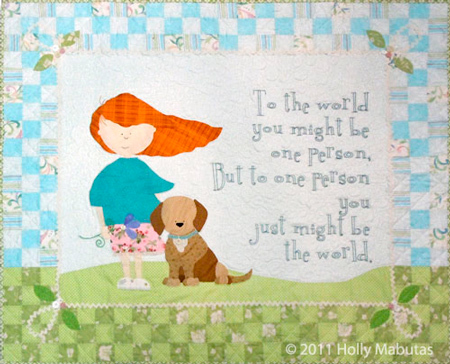 To The World is available over on the quilt pattern page at Eat Cake Graphics. 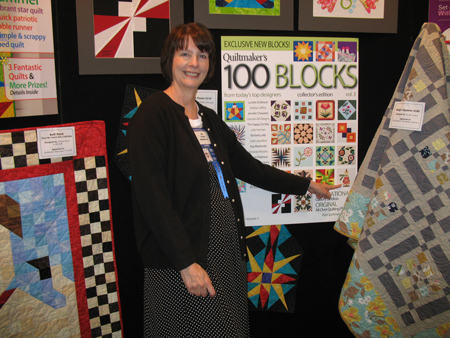 I’m off to Salt Lake City tomorrow for International Quilt Market, Spring Edition. My publisher has lined up a couple book signings for me, which are so much fun and quite a heady experience. See you after I get home! 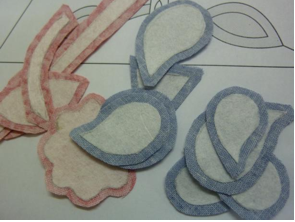 As promised, today I’m learning a method of hand appliqué preparation that’s new to me. 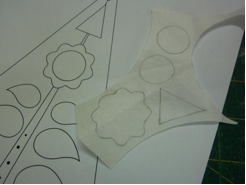 Holly Mabutas of Eat Cake Graphics gave me her pattern insert with instructions for what she calls “glue stick turned edge appliqué” and I’m trying it out! 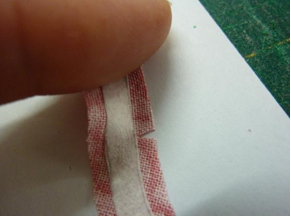 What intrigues me about this method is that the margin of the fabric is glued back on itself. 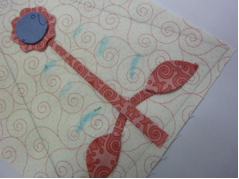 I’ve tried the other kind of glue-stick appliqué, where the margin is turned and glued over freezer paper, then after stitching you soak the block, slit the back, and get the freezer paper out. That method never ‘stuck’ with me, no pun intended. 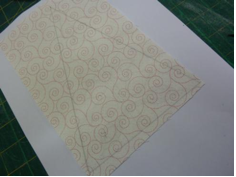 Now I’m going to try it this way, where the freezer paper is on the front of the fabric. The first thing I did was to go out and get a brand-new glue stick. I happened to know that the ones I had were a mite dried out — moral of the story, don’t buy them too far in advance, or try keeping them in the fridge as a friend of mine told me. As it happens, we’re having a heat wave in Santa Cruz. There are just a few days a year when we roast… yesterday it was 102º and I was sweating just sitting upstairs in my studio. So today I gathered up everything that I needed and put up my handy-dandy little table from Costco downstairs in the living room to work in cooler conditions. 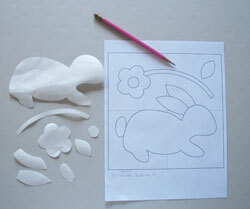 Freezer-paper templates traced and cut out. 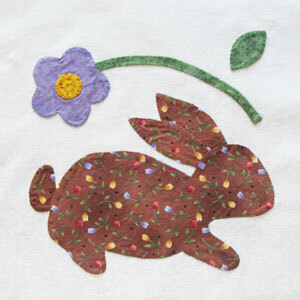 I used the bunny block from my Spin in the Garden pattern. I had to run upstairs to iron the templates onto the right sides of the fabrics. 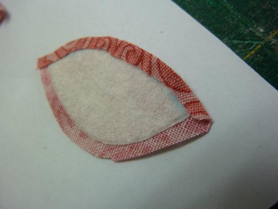 I used a piece of cardboard underneath, which helps create a better bond. 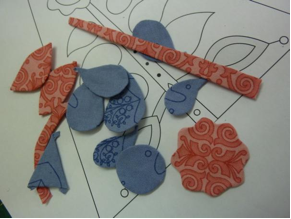 The next step is to trim the motifs, leaving a scant ¼” turn-under margin. 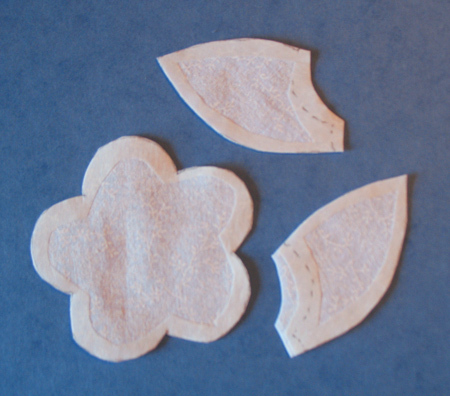 Here are the pieces, trimmed and clipped. There’s a dashed line on areas that are going to be overlapped by another piece. Gluing the margin back onto itself on the wrong side. 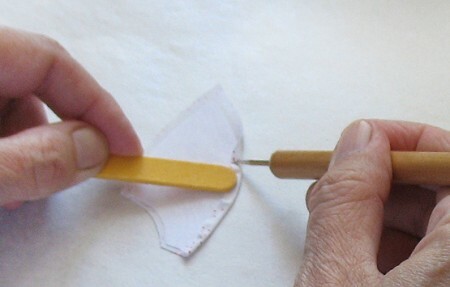 Holly says to use an awl… I didn’t have one so I used a stylus with a tiny, sharp tip. 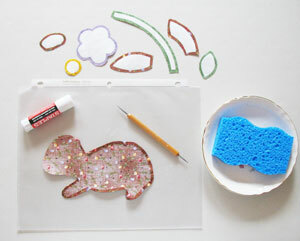 The moist sponge is for cleaning off the glue stick when it gets thready. I’m working on top of an plastic sheet protector. 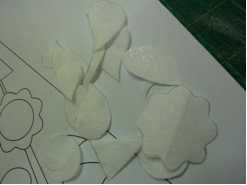 Here are all the pieces glued and with templates removed. Again using the sheet protector, I’m positioning the pieces to join them together into units. No background fabric involved at this point! Holly advises using little dots of Roxanne’s basting glue for this step. I didn’t have any so I hauled out some really ancient stuff called Border Patrol. Turns out this was a misstep on my part, and I’ll tell you why later. 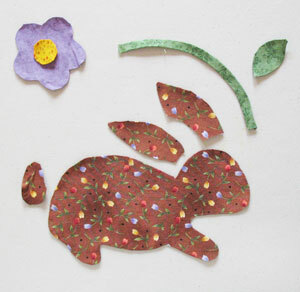 Anyway, I used it on the edges of the tail and ears that were going under the body piece, and glued the bunny together. 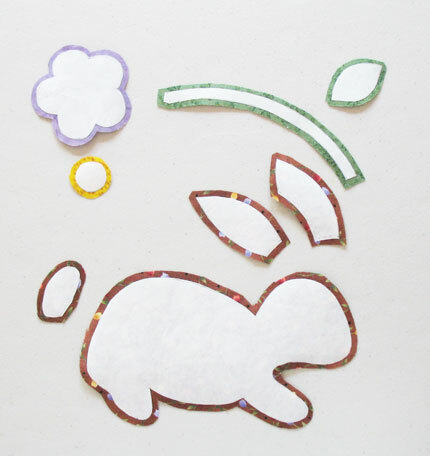 Here’s a whole bunny, separate unto itself, edges turned and ready to hop onto different background fabrics until it finds its favorite one. 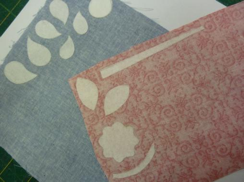 Here I’ve positioned all of the elements on the background fabric and have used the liquid glue to secure them in place. Still hoping I can work out those pokies. 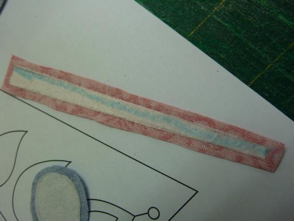 All stitched… and it worked! I was able to manipulate out the little bumps. 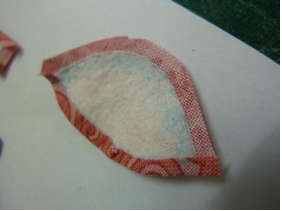 For the more serious ones, I dipped a cotton swab in water and soaked the edge of the motif. 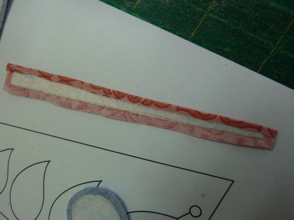 The glue released immediately and I was then able to smooth out the curve with my needle. Okay so here’s why the liquid basting glue I used was not a good choice. 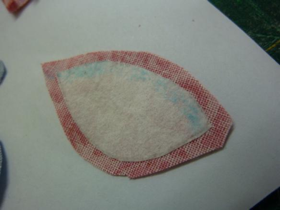 Turns out, unlike Roxanne’s, it’s a permanent glue, and I used it in some injudicious places. See the little spot on the bunny’s paw? 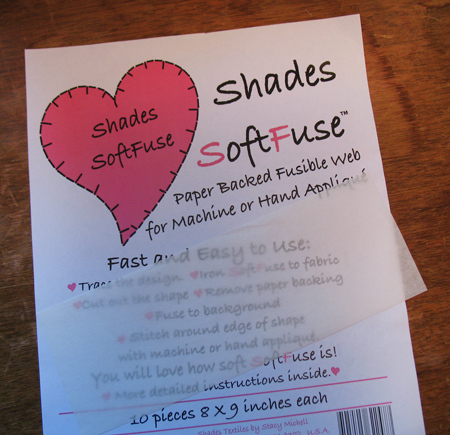 It’s confusing, but when you look at glue labels, you want it to say “water soluble” or “washes out.” “Washable” means it doesn’t wash out! 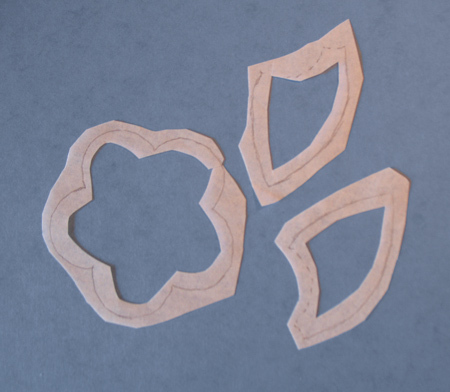 Anyway, aside from that little “learning experience,” I’d say this is the best method of turned-edge glue stick appliqué I’ve tried. For one thing, you don’t need a reversed pattern… what you see is what you get. 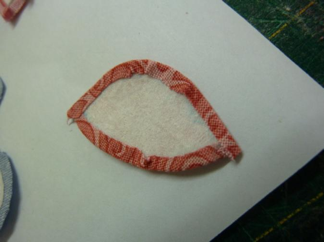 Plus, you don’t have any freezer paper to remove once you’ve finished stitching. Holly appliqués these by hand, and so did I. 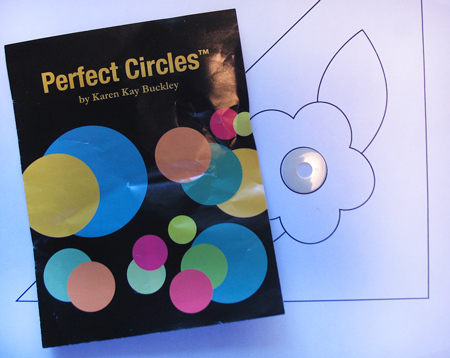 If the templates were on the inside you’d have a crinkly, crunchy time of it, but here, where they’re gone already, it was a pleasant stitching experience. And a big thundercloud came along and cooled things down considerably. 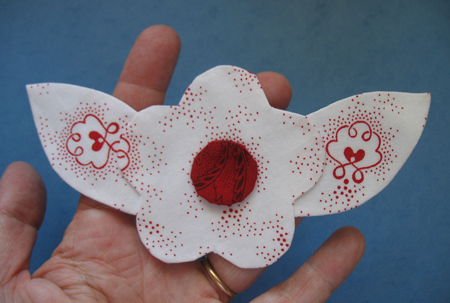 Thanks a million, Holly, for sharing your preferred method with me, and allowing me to show it other appliqué fans. 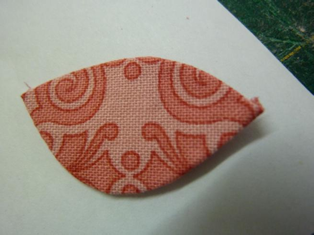 If you like an edge that’s already turned before you start stitching, this might become your favorite too! 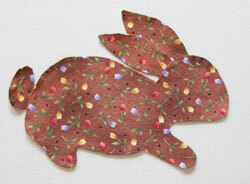 Get one of Holly’s adorable patterns and try it out for yourself. See A Spin in the Garden over at Quilt Puppy.